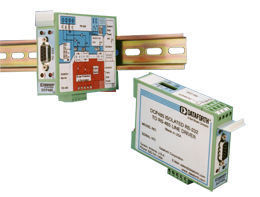 Industrial LANs and ​data communication ​systems stretch over long distances, inside and outside, with signals exposed to electrical transients, noise, ground loops, power surges, and lightning. Commercial communications equipment often is not designed for use in these environments, which can lead to unreliable signal quality, damage to expensive peripherals, computers, and other online equipment, and production downtime. Dataforth's heavy duty products "harden" and protect these systems, and can extend communications for many miles without expensive low-capacitance cabling.